As i expected, Shinji by Kanesaka as my favourite sushiya in Singapore won its first Michelin star in the firstMichelin Guide Singapore. 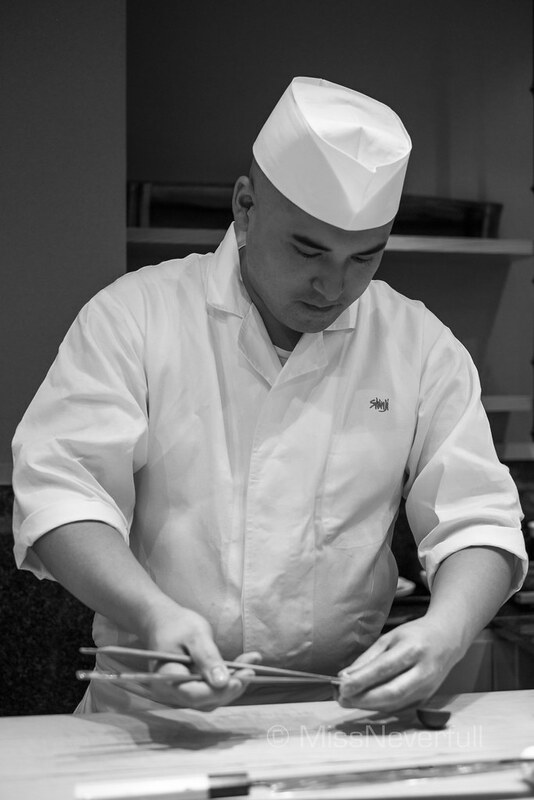 Is original branchSushi Kanesaka in Ginza, Tokyo has been honored one star for continuously years. Currently having three oversea branches in Singapore ad Macau, the one in Raffles Hotel is Kanesaka's first step outside Japan. Unlike other high end sushiya such as Hashida or Sushi Ichi, where there's only one master chef makes nigiri sushi, with 1-2 helper at the counter, here at Shinji as well as Sushi Kanesana in Ginza, around 5 sushi chefs make sushi at the counter so that more guests can be served at the same time. 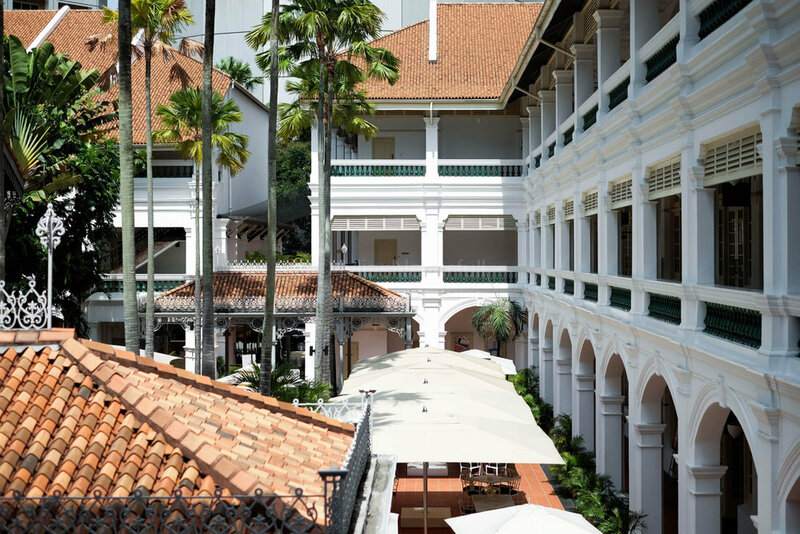 Shinji at the Raffles Hotel can seat up to 15 guests at the counter, there are also few private rooms available. Unfortunately the Master chef Oshino went back to Japan for sourcing better ingredients, we requested Yoshi-san to taking care of us. Lunch menu start at $75 up to $250 for Omakase. Three sets were served during dinner time, priced at $220, $300 and $450 respectively. I again had lunch Omakase at $250 Singaporean dollars. The Omakase menu includes several Tsunami (appetisers) followed by nigiri sushi and desserts. The first appetizer was the roe of Hamo (pike conger) with tomato and edamame. Hamo-no-ko is one of the best seasonal produce which has a creamy texture and tastes mildly sweet. Followed by another seasonal dish was simmered winter melon with dash jelly and shrimp. A classical sashimi at Shinji is Shima-aji, the finely cut fish was very fresh, the tastes was deep and umami. Next arrives my favourite uni with Ika (squid), the Ika was incredibly sweet and creamy, uni too was packed with oceanic flavours. Both sashimi have a sweet hint which was hard to resist. Seared fish was served - include Kamasu (Sphyraenidae) from Sajiman, and braised Tako (octopus) from Kanagawa. I loved the flavour of Tako although the texture was more on the chewy side other than soft and tender. Summer is the best season to have Japanese tomatoes. These tiny tomatoes from Aichi has a balanced flavour of sweetness and sourness, so cute. The last dish before serving nigiri sushi was cooked Hamo (conger eel) with eggplant from Kyoto. Although the Hamo in this season is not fatty and creamy as those in winter or unary, the moderate fat content and its aromatic tastes was also enjoyable. 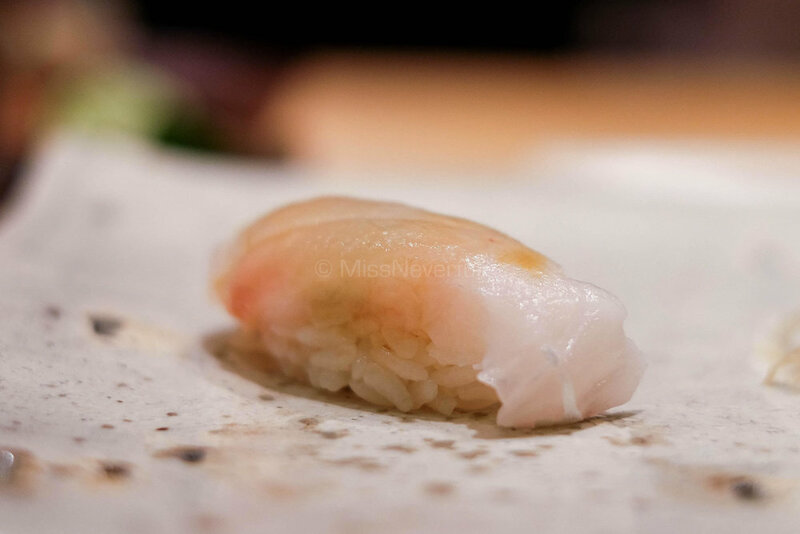 After serving the white fish Tai (snapper) which has a clean tastes, three maguro nigiri was served in sequence. Compare to the Otoro which has quite high oil contents, i also prefer chutoro which is leaner but the high tastes still. Akami is the lean part of tuna fish, it was marinated ( 'zuke' in Japanese) to lift the flavor. As always, Kanesaka and Shinji both serve a smaller shari (sushi rice) for their nigiri sushi, the ratio of rice and fish was right to point. I personally preferred their shari size so that i have more room for more fish. Chefs uses a little bit akazu in their shari to give it a slightly stronger taste. It was served in body temperature which matches well with the body temperature of the fish. Aji is always an enjoyable prices for its deeper flavour and moderate fats. 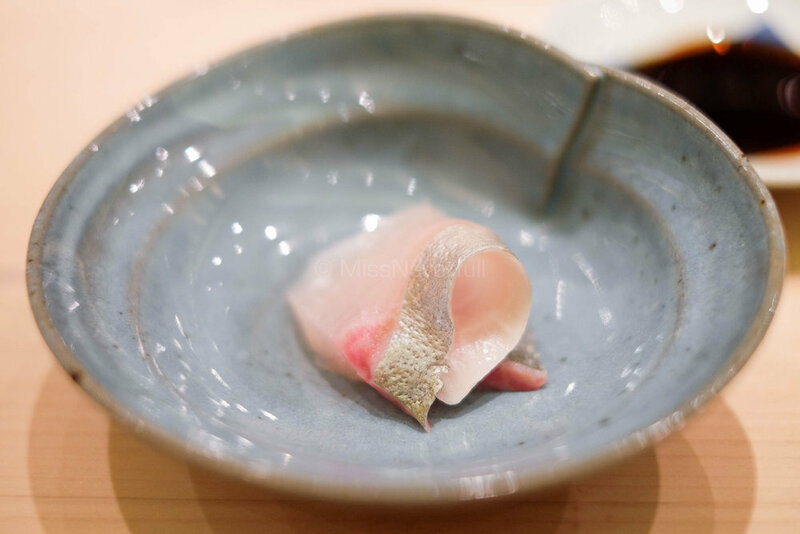 Served with its best friend - negi to bring an aromatic touch and lift the flavour of the fish itself. It is always hard for me to resist uni, especially when a whole box of uni was placed in front of me. I loved the creamy and fresh uni with a burst of sweetness, but unfortunately the nori (seaweed) was not crispy but soft. 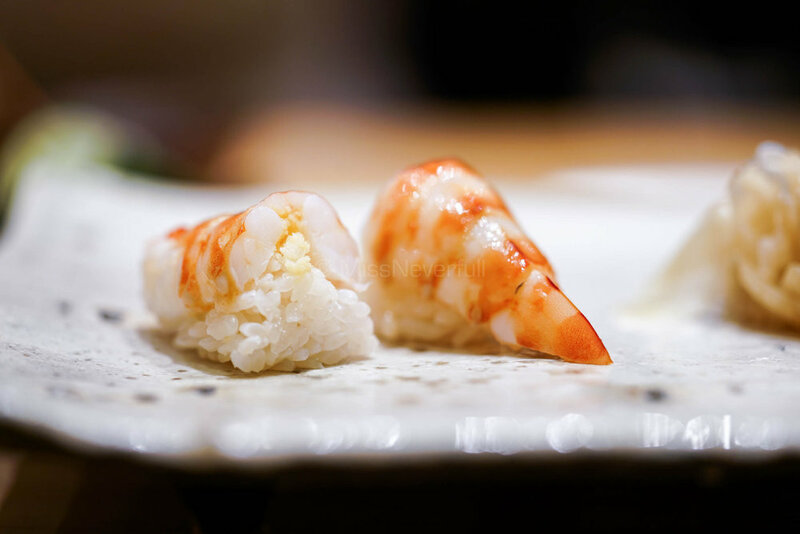 Kuruma Ebi was served cold, although with a perfectly tender texture, it was kinda lack of fragrance. Anago with Tsume (sweet sauce) was always an enjoyable piece to me, while Shinji's Anago this time was not for me. I preferred the freshly grilled/steamed ones with a melt-in-mouth tenderness, or a slightly crunchy skin for the grilled one, while this one was a bit dry in comparison. But its umami flavour made it up. I told chef Yoshi than i am not a big fan of maki sushi (sushi roll), he made the regular size Negi-toro (chopped toro) roll for my friends and a kids size roll for me, together with a mini chopped toro bowl. The maki was so cute! I cannot stop myself stealing my partner's regular size maki as a comparison. Both the maki and mini bowl were lovely - creamy and flavourful chopped toro with super delicious oils. Shinji's tamago (Japanese egg custard) is my personal favourite in Singapore. 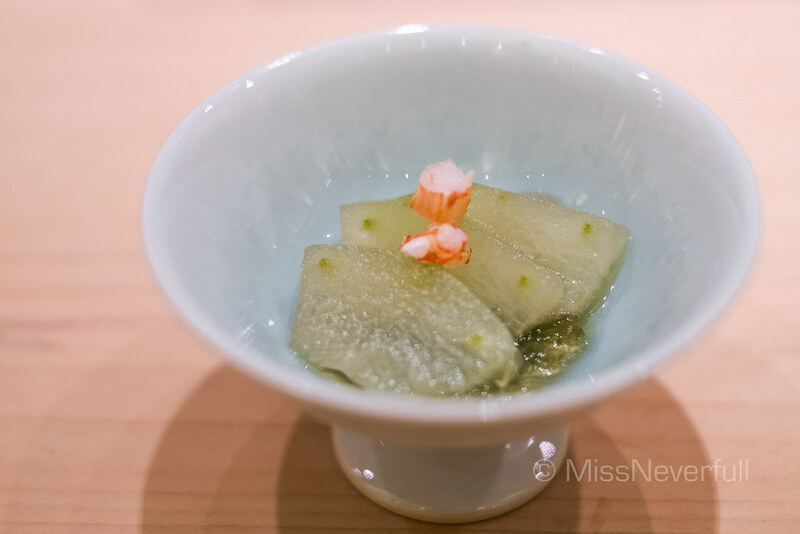 It has a jelly texture and packed of aromatic prawn flavours, sweet and umami. It was grape and melon season in Japan, thus we were treated a dessert of natural sugar - musk melon and Kyoho grape. The melon was so soft, creamy, juicy and sweet, the grape has a hint of sourness which brings a lovely ending. Although few pieces of nigiri can be better-done, the overall experience at Shinji was great - it is still my favourite sushiya in Singapore. It is hard for this tropical country to feel the seasonal breeze while at Shinji, the best seasonal produces in Japan are served. It is definitely not cheap to eat at Shinji, but trust me it is worth of value compare to all the other sushiya in Singapore. A must-go for sushi lovers who have no time to travel to Japan very often. 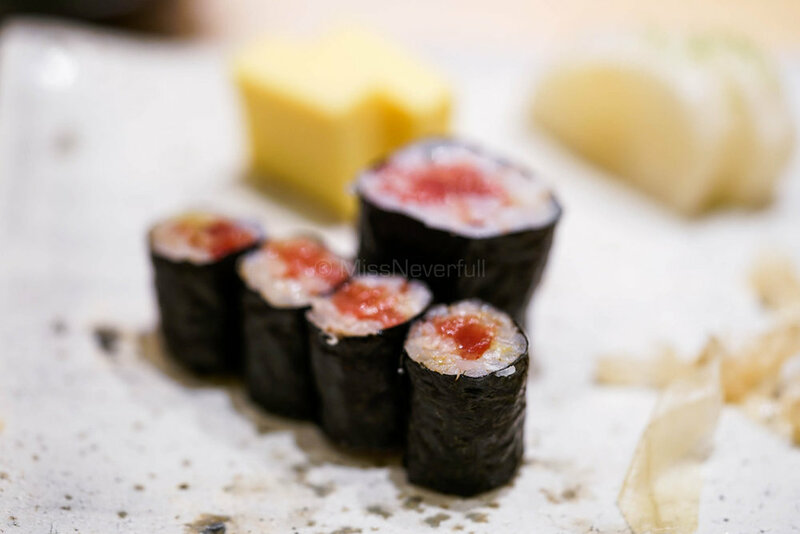 For gourmet travellers who eat sushi in Tokyo very often, save your money for later trips in Japan and have local food in Singapore, but worth a try if you are super craving for sushi everywhere.